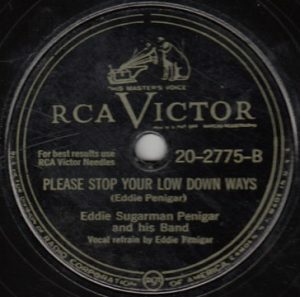 Eddie Penigar was a minor peripheral figure on the outskirts of rock ‘n’ roll in the 1940’s, more notable for whom he was associated with than anything. His biographical information is fairly limited, but he was born in 1916 in Arkansas and settled as an adult in Chicago where he worked as a session musician for Aristocrat playing saxophone as well as leading his own band locally. Leonard Chess, who would go on to work at Aristocrat and eventually buy the owner out and re-name the label after himself, had originally tried bringing in Penigar as a pianist for his nightclub The Macomba Lounge in 1947 but ran afoul of union edicts in his attempts to do so. That does give some insight however into Penigar’s musicianship as well as his eventual recruitment, along with the Macomba’s bandleader Tom Archia, to the Aristocrat stable that same year. Surprisingly he was signed to TWO major labels in the late 1940’s, the first being Columbia in 1947 as a member of the Chicago All-Stars (the first of many loose-knit aggregations to use that name), a super group of sorts that featured many Aristocrat musicians including fellow horn player Sax Mallard and drummer Jump Jackson, though Penigar was featured as a vocalist in addition to his tenor sax duties. Those records were decent big band derived jump blues with solid interplay between the musicians behind the rather generic lyrical themes. His more significant releases came as the credited artist on RCA-Victor which also included Mallard on second horn, though for one side of the singles he often enlisted an outside vocalist, George Layne in 1948 and more notably LaVern Baker on her first released sides in 1949 going under the name of Little Miss Sharecropper. The Penigar led band however were the weakest aspects of those records and he never made much headway as a featured performer. Penigar remained situated in Chicago for the rest of his career, dying in the Windy City in 1969. As sideman… for Jump Jackson. As a possible sideman… for Tom Archia.